THE GUNTHER GANG: Spontaneous Date Night. When Tay got home from work yesterday, we found ourselves curled up on the love sac together staring into the prospect of an entire evening with absolutely NO PLANS. I don't even remember the last time that happened? Typically there's always something that needs to be done, but last night we really didn't have much on our to-do list and we hadn't made any prior arrangements to do anything. We were as free as birds. It was miraculous. We decided we'd head out to grab some dinner before going and mini-golfing for a fun little date night. (Everyone keeps telling us to start getting in the habit on planning and going on regular "date nights" before the baby gets here so it will be easier to continue the tradition once she's born.) Ironically enough, the first TWO places we attempted to go and get dinner were not only "closed," but completely out of business!? We were laughing so hard because we were in the mood for something very specific and somehow, when we weren't paying attention, all of the restaurants in our areas started going extinct. The THIRD place we decided to go was a little bit out of the way, but I'd eaten there before and I really wanted to take Taylor there to experience their delicious food... we pulled up to the restaurant and lo and behold it had weird Monday hours and had closed at 3pm. We were 0 for 3 and utterly stunned at our bad luck (but also seriously laughing as the evening progressed and we kept getting shut down). FINALLY we just opted to go to Tsunami because it was staring us right in the face and we were starving! 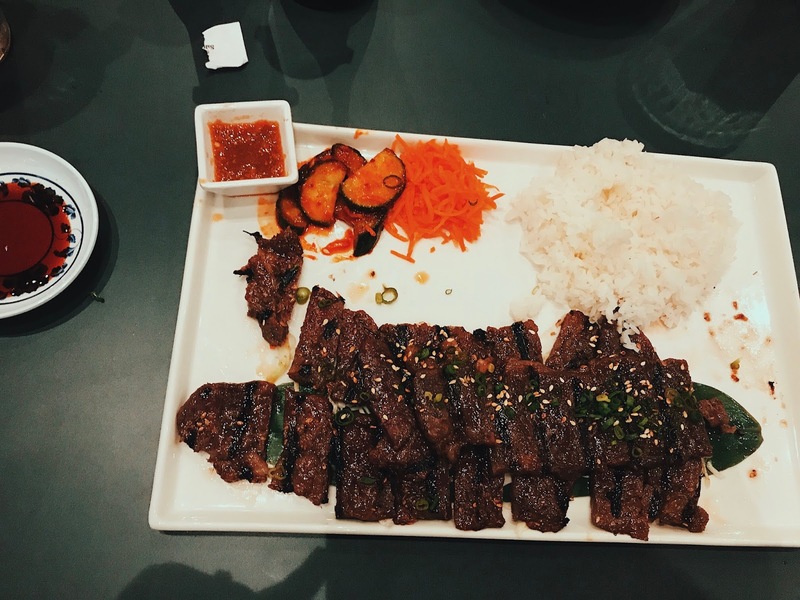 We ordered the Korean Style Boneless Beef Short Ribs (which is literally making my mouth water just thinking about it) and a couple of Vegas sushi rolls (because yum). Totally hit the spot. The food tasted fantastic (but maybe it was just because we went on a mad goose chase just to find a place to eat some food). We hit up a good ol' mini golf course that was as ghetto as ever and only made it about halfway through the course before one of the holes swallowed up both of our golf balls and they were never to be seen again. I had tears in my eyes practically all night long because of how much we were laughing (I also almost peed my pants on multiple occasions, but we won't dwell for long on that fact). It was sweet to spend an entirely unplanned evening with Taylor Dale-- it almost felt as if we got transported back to our flirty high school days when we'd go on silly dates like that all the time (except just replace the nicer restaurant meal with a wendy's or mcdonald's meal and it would be way more accurate). Date nights are important, I've decided. I'm going to be more persistent at deeming one night a week our "date night" and start doing things for date night that we wouldn't normally do just to mix things up.